Welcome to the website of Swimming Human Simulation Model "SWUM"! 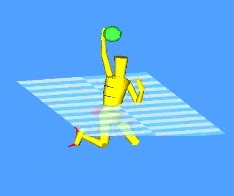 SWUM (SWimming hUman Model) is a Swimming Human Simulation Model, which has been developed as a powerful analysis tool for various dynamical problems in human swimming. In SWUM, the absolute motion of the whole human body is solved from the equations of motions for the fluid force and the body inertia, by giving the relative body motion (joint angles). SWUM enables you to analyze the various dynamical problems in swimming, such as the effect of difference of the swimming form on the swimming speed and the absolute body motion. SWUM has been developed by the developer team which is led by Prof. Motomu Nakashima, Tokyo Institute of Technology, Japan. A software "Swumsuit" was developed as an implementation of the ideal model SWUM. In addition, Swumsuit enables everyone to perform simulation of the human swimming with easy GUI (Graphical User Interface) operation. Swumsuit is a Free Software based on GPL (GNU General Public License). For the detail of Swumsuit, please see Swimming Human Simulation Software Swumsuit page. By Swumsuit version 3.0.0 or higher, you can output files for the musculoskeletal analysis software "AnyBody Modeling System". By using Swumsuit and AnyBody Modeling System, you can conduct the full-body musculoskeletal simulation for swimming. Simulation examples for the four strokes are shown as below. 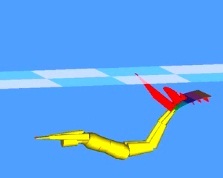 The mechanism of the underwater dolphin kick has been analyzed by SWUM. After the analysis of the dolphin kick by a top athlete swimmer, optimizating calculations to maximize the swimming speed and propulsive efficiency were conducted. The details are in the Reference 6 below. 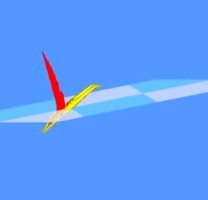 The dive start has also been simulated by SWUM. For this simulation, a special fluid force which acts on the body during water entry has been introduced to SWUM. The details are in the Reference 7 below. By Swumsuit 4.0.0 or higher, the "Multi Agent/Object Simulation" has been enabled. "Multi Agent/Object" means multiple swimmers, such as synchronized swimming, and multiple objects with a swimmer, such as equipment in the water. The below examples are monofin swimming (swimmer + monofin), the shooting motion in the water polo, and the lift in the sychronized swimming. The details are in the References 8, 9 and 13 below. SWUM has also been applied into the walking in water, which is very effective for rehabilitation. In this analysis, the ground reaction force acts on the foot in addition to the fluid forces. The details are in the Reference 10 and 11 below. Please feel free to contact us about SWUM to the mail address: swum-admin_at_swum.org (Please change "_at_" into "@").